The Governments of Canada and Alberta are making a significant investment in the preservation and regeneration of affordable housing in Calgary. Some $18 million in joint funding will go toward the repair and renovation of social housing units for seniors and low-income families and individuals, ensuring they have safe and efficient places to call home. The joint contribution of $18 million was made through the 2016-2018 Social Infrastructure Fund, which is a two-year federal and provincial agreement to help Albertans in need access affordable housing. The funding will support capital maintenance projects such as heating, ventilation and plumbing repairs, along with renovations and replacements of roofs and elevators, which are needed at affordable housing sites across Calgary. Projects that will receive funding include government-owned or supported seniors, community and special needs housing. Projects will take place in more than 120 buildings owned or operated by 29 social housing providers. The announcement took place at Bridgeland Place, which is owned by the City of Calgary and operated by the Calgary Housing Company. It will receive $648,000 for suite renovations, replacing shut-off valves, a roof inspection and sidewalk replacement. "Our Government is investing in affordable housing here in Calgary and across Canada to help create jobs and improve the quality of life for those who need it most. Thanks to the combined efforts of our partners, we are able to give a hand up to Albertans in need, and in doing so, we are contributing to the economic and social well-being of the entire community." "Many housing units in Calgary are in disrepair. That's why our government is taking action by investing in renovations so Calgarians have a safe and affordable place to call home." CMHC has been helping Canadians meet their housing needs for more than 70 years. As Canada's authority on housing, CMHC contributes to the stability of the housing market and financial system, provides support for Canadians in housing need, and offers unbiased housing research and advice to Canadian governments, consumers and the housing industry. Prudent risk management, strong corporate governance and transparency are cornerstones of CMHC's operations. For more information, please call 1-800-668-2642 or visit www.cmhc.ca. The Alberta government ministry of Seniors and Housing fosters the development of affordable housing and supports access to housing options for Albertans most in need. The Alberta Jobs Plan will invest $1.2 billion for affordable housing capital needs over the next five years. To achieve these outcomes, the ministry works with seniors, Albertans who require housing supports, their families and caregivers, communities and other government partners. A more detailed description of the ministry and its programs and initiatives can be found at www.seniors-housing.gov.ab.ca. 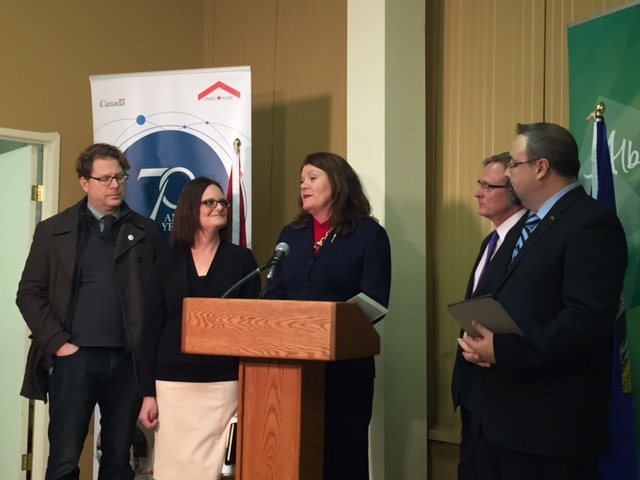 Funding announced by the Federal and Provincial governments for repairs and renovation to social housing in Calgary.